On Saturday we went on an incredible day trip. It ranks among my top 3 New Zealand experiences thus far. We woke up early and left at 6:00AM. 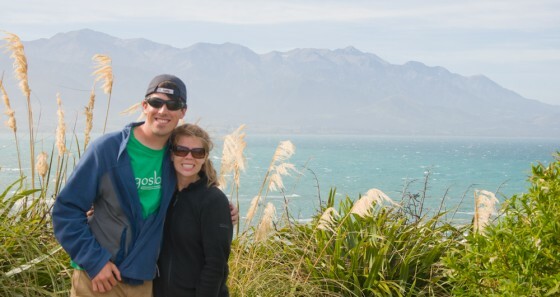 We had a 2 hour drive up the coast to the city of Kaikoura, which is world famous for its rich marine life. 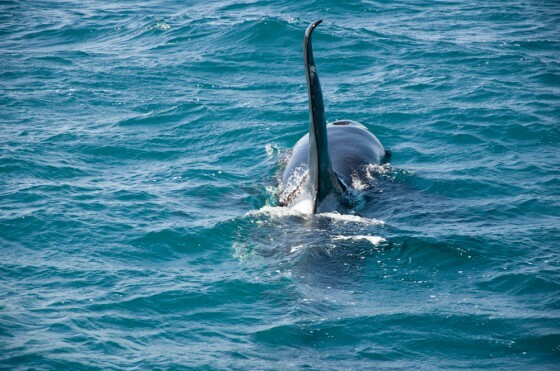 There are plenty of whales, seals, albatrosses, and dolphins. We had booked a dolphin encounter, and I was stoked. 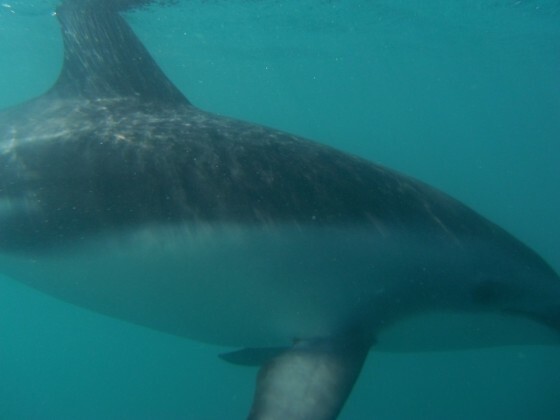 Swimming with dolphins was a life ambition of mine, and I was pretty pumped to be swimming with them in the wild. 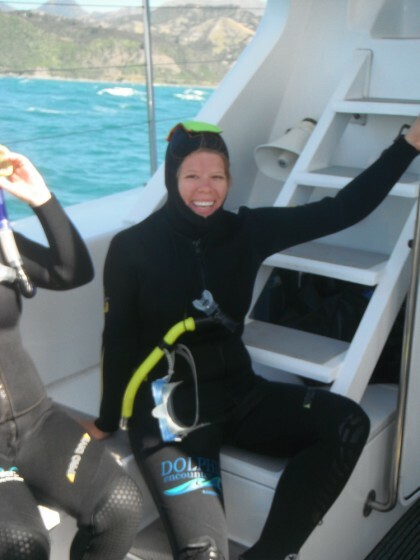 After check-in, we suited up into some serious wet suits. The water is quite cold, but these wet suits kept us very warm, which was pretty nice for those of us who are used to Gulf of Mexico water temperatures. Before shipping out, they warned us that the water had become very choppy in the last hour or two. The sea was so rough they said they may have to cancel. Anyone who wanted out had the chance, but we had come too close to turn back. Then came another warning: Orcas had been spotted on the coast. 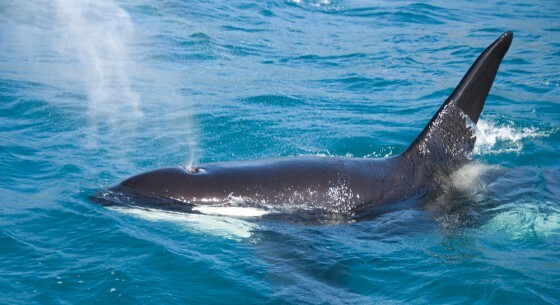 Orcas are more commonly known as Killer Whales, and they are a natural predator to the Dusky Dolphins we were going to swim with. 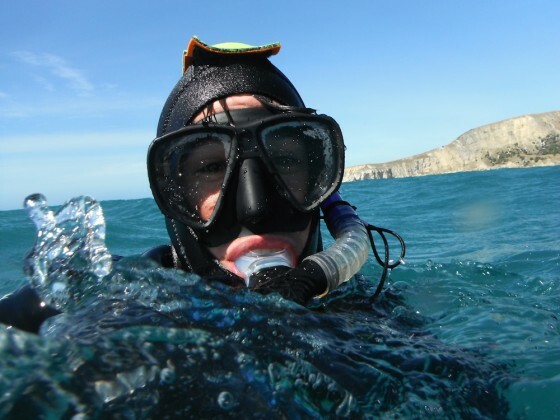 Our guides said they may scare off the dolphins, but we decided to go out and see if we could find them anyway. We hopped on our boat and headed out. Their warnings about the choppiness were not exaggerated The sea was angry that day my friends. Swells were often 9-12 feet tall and our boat was rocking. After a few minutes of travel, all our guides got really excited. “We’ve spotted the orcas!” We put our dolphin hunt on hold and stopped to observe the killer whales. Coincidentally, randomly seeing whales is also on my bucket list. So this was pretty convenient and awesome! For those of you who will tell me that killer whales are not technically whales, keep your spurious biological views to yourself! We got a few pretty amazing photos of them and attempted to get some decent video, but like I said, the sea was angry and my camerawork was pretty shaky. After 30-40 minutes, we continued on our journey, hoping to find dolphins. Now, I’ve never been seasick in my life. But after rocking up and down for so long, the fun roller coaster sensation was beginning to turn on me. As we moved closer to the dolphins, I wasn’t feeling too great. I figured hopping in the water would help, and I was right. 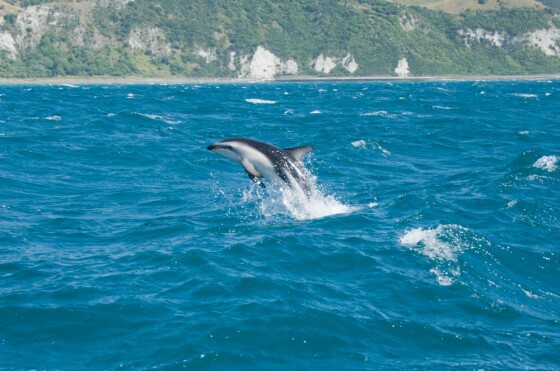 I completely forget about sea sickness when we finally found dolphins and began swimming with them. These were wild dolphins and the tour company does not feed them. 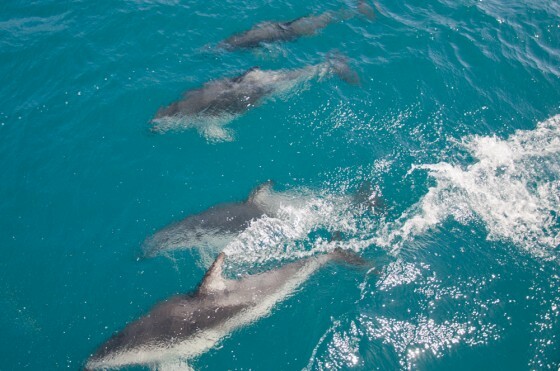 They travel in pods between 100-1,000 dolphins and we simply go out and find them. As our guides said, “Don’t expect the dolphins to entertain you, because you are supposed to be their entertainment.” Dolphins love noise, and so they encouraged us to click, sing, hum, and do whatever else we could to get their attention. I of course, chose to sing the Braves Tomahawk chop for them, and they loved it. They swam so close to us, within touching distance. We were told not to touch them, however, because this would spook them, but we totally could have reached them if we tried. As soon as we got back on the boat (which was rocking even worse now from the waves) my seasickness returned with a vengeance. I hate throwing up with everything in me, and so I fought it hard. But the ride back was too long and too bumpy, and so I joined a new bucket list. Yep, I spewed right into one of the convenient barf buckets on board. The crew was super friendly through this time, they even took my bucket and cleaned it out to give me a fresh one. Well, I guess there is a first for everything! Despite my unfortunate illness, the whole experience was totally worth it. We would both definitely do it again (although I’ll be investing in some seasickness meds next time) and had a great time. Once we got back on land and I hugged a stable tree, we wandered around town and ate lunch at a local cafe. 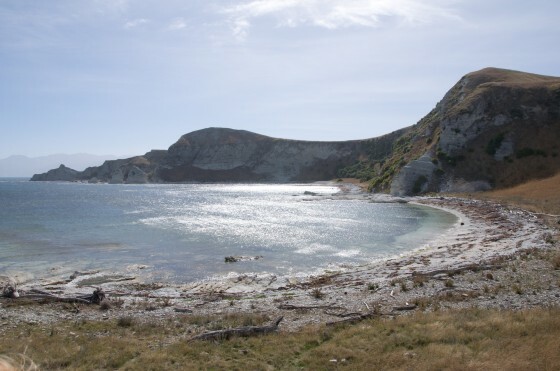 Kaikoura has a very popular walk along their peninsula, and so we drove out there and spent a couple hours hiking along the shore and up on the cliffs. The area is breathtaking. 300 foot cliffs rise right above the ocean and have such intricate shapes and unique colors. 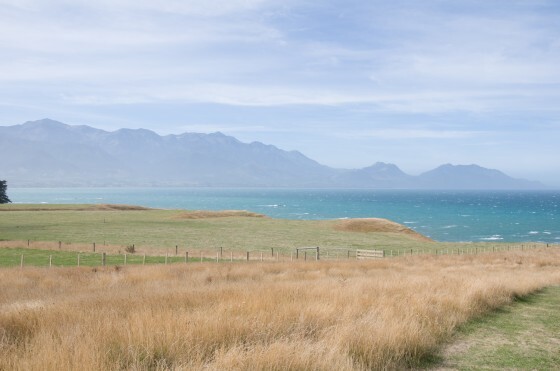 Once you move up off the shore and on top of the cliffs, you have a great view of the North bay and the mountains that rise up above Kaikoura. It is truly spectacular to see the ocean and 8,000 foot high mountains so close together. 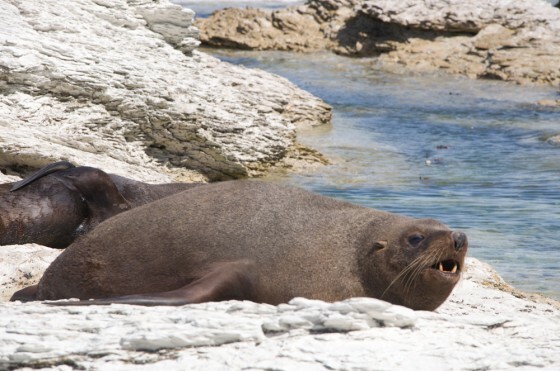 There are also plenty of New Zealand fur seals hanging around the Peninsula walk. We said hey to a few of them and took some pictures. They are rather territorial on land, so you cannot get too close to them. Morgan, of course, still got as close as she could and one even growled at her. 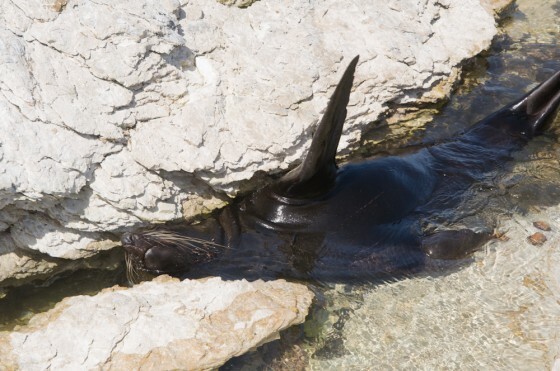 But then again, another seal waved at her so maybe she broke through to them somehow in the end. After our walk, we had a seafood dinner right off the beach at a local shack and started our drive home. It was a full and tiring day, but not one we shall forget for years to come. That’s really awesome! I love it!! (though it does make me homesick as there’s not much about that that doesn’t look like “home” – Hawaii – for me). We did that once and it truly is an amazing experience. We weren’t on an official tour; my sister, friend and I were swimming near shore and saw the pod and decided to swim out to it. They swam and jumped all around us just like in your video – so, so amazing!! I’m enjoying your blog! One of Mark’s bucket list items is to GO to New Zealand. It really looks like a beautiful place. Hey cool! I bet the water was much warmer in Hawaii too. New Zealand is a great place to go to!